Under the leadership of Niti Aayog, India hosted in Delhi its first Global Mobility Summit on 7 & 8 September 2018. Addressing an impressive line-up of CEOs from all over the world, the Prime Minister of India, Mr Modi shared his vision for the future of mobility in the country. IRF was among the key transport stakeholders invited to share its expertise during the summit. Pitching the concept of 'clean kilometres,' Prime Minister Narendra Modi made a strong call for public transport and electric mobility. He said the use of private cars should be moderated while public transport, scooters and rickshaws running on electric solutions should increasingly dominate the mobility eco-system in the country. "Public transport must be the cornerstone of our mobility initiatives… Our focus must also go beyond cars, to other vehicles such as scooters and rickshaws”. Underlining the need for electric solutions, the Prime Minister said that "charged mobility is the way forward" for the country. "We should champion the idea of ‘clean kilometres’," continued Mr Modi, adding that there is also a need to encourage walking and cycling by making roads safer for those road users as well. PM Modi’s vision is that of a clean mobility powered by clean energy. This is - in his words - the most powerful weapon in the fight against climate change. 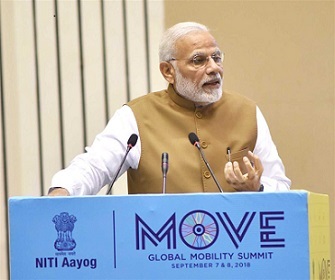 The Prime Minister said his vision for the future of mobility in India is based on 7 C’s – "common, connected, convenient, congestion-free, charged, clean and cutting-edge”. Mr Modi reminded the audience that India is the sixth largest producer of renewable energy and the fifth largest producer of solar energy in the world. IRF has entered into a Statement of Intent (SOI) with NITI Aayog, Govt. of India, to work towards a coherent national ITS policy that will enable PM Modi’s vision for the future of Mobility in India.